There’s something mind-bogglingly awesome on your television. It’s in between the channels – no picture, just sound. And not just any noise. One hundredth of the fizz-crackle-hiss-buzz sound your blind grey screen’s emitting is something goose-bump-inducingly extraordinary. Yes, your delicate, human, evolved-from-apes’ ears could – really could – be hearing the Big Bang’s audible aftermath. Reaching far-flung human beings on Earth more than 13 billion years after it happened. Now that is cosmic. Awe inspiring. Mind-blowing. I learn this on a great day out. Sunday dawns fair-ish. Rain promises. Clouds hover in solitary white pufflets, then big grey bullies arrive, frightening them off. We decide to skip the 11.30 ‘religious for a year’ appointment with Mass. Today we’ll be investigating a different kind of mystery. On an average day I try hard not to think about these things. My head reaches a certain point and knows, just knows, it cannot cope. It melts my cerebral hard drive. Oh little human, so bounded by the real, the here. The everywhere and nowhere. The now and then. I cannot comprehend a universe that isn’t SOMEWHERE. Which, I suppose, means I have to believe in a God. Because that’s the only way I can explain it. There’s more to life than what we know – or can ever know. Back to Jodrell Bank. The name’s been in my consciousness since my family first had a television. A special late night treat for a little girl – The Sky at Night. Entranced by Patrick Moore and his eyebrows, enthused by the passion of a polymath for things beyond our ken. For me it’s the music of profound humility, acknowledging the immensity of the night sky, the stars, moons, planets – and the galaxies. So it’s a pilgrimage, really, that we’re making, to this great, white, cathedral of a telescope. 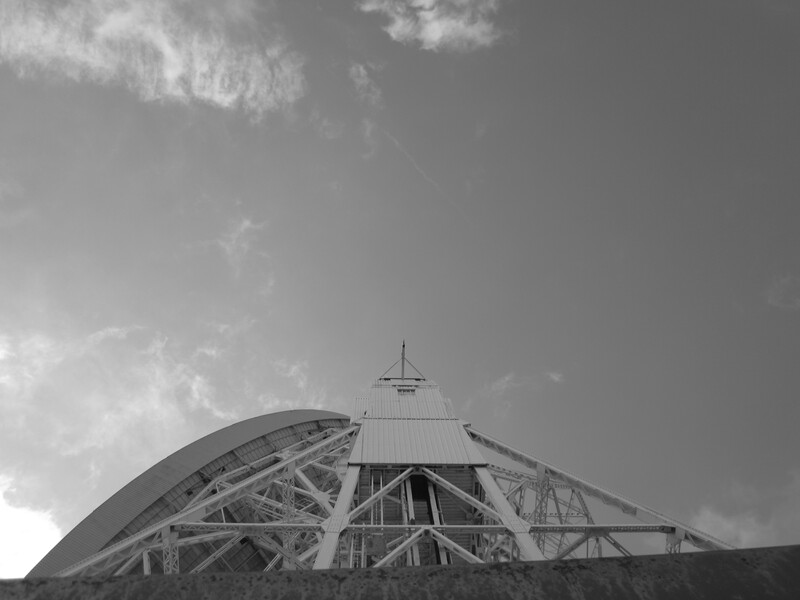 You can’t see anything through it – it’s a radio telescope. You can’t climb onto its dish or up its ladders. It’s surrounded by fecund fields, sheep grazing, daisies blooming. With a groan the motor starts, chugging like a passing slow train. The great wheels grind and turn, moving the massive structure round at a speed you can barely detect. Rapt, I watch as the immense white dish tips, moving almost imperceptibly until it’s facing a different way – and you know, it’s listening. As it was in the beginning, is now and . . . 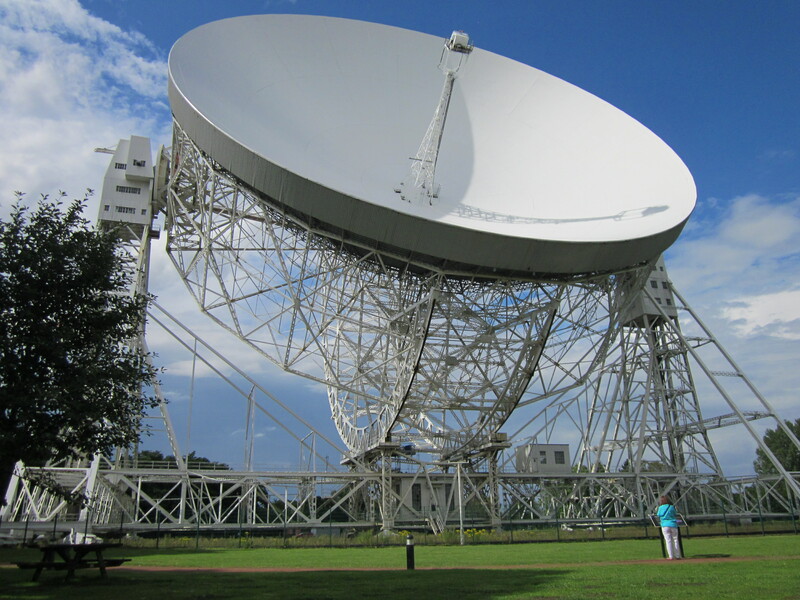 This entry was posted in Religious for a year: Atheist-man's experiment, Thinking, or ranting, or both and tagged Big Bang, Creation, Jodrell Bank, Patrick Moore, radio telescope, Sibelius, Space, The Sky at Night, Time, Universe. Bookmark the permalink. Thank you for that Husk. It was a great way to start the morning … Listening to/for the music of the spheres. I haven’t downloaded your book yet, but it’s definitely on my to-read list which I’m determinedly going through. I’m glad – I felt so inspired by that visit I genuinely wanted to share it. And don’t worry, I won’t start chivvying you about my book, read it when you can and I just hope you enjoy it! It was wonderful, just the thought that I have heard the beginning of things… wow. I am just fazed by the immensity of it all… (yes, even the little things as you say like atoms).